G2E gives you THE POWER TO SUCCEED. As the economy, and the gaming industry continue to evolve and change, G2E continues to keep you at the forefront of the latest trends and insights. 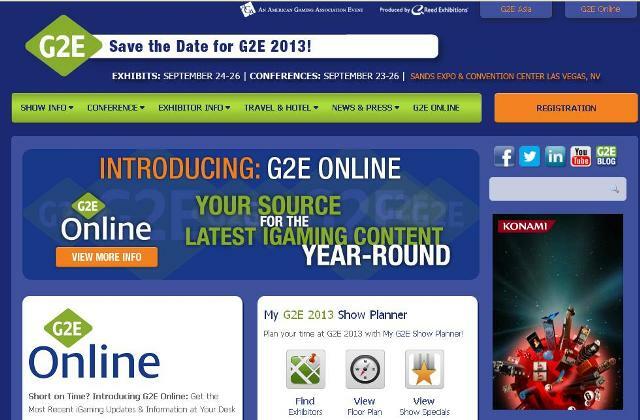 With the expertise and invaluable content that make G2E the must-attend event of the year. View the exhibitors showcasing the latest new products on gaming’s largest show floor. Don’t miss the daily lineup of keynotes where you will enjoy insights from thought leaders and industry luminaries. Find Exhibitors, View Floor Plan and all of the New Products and Show Specials featured at G2E 2013. Coming soon—start networking with attendees before G2E by linking your registration and LinkedIn profile to your My G2E Show Planner! This dedicated food, beverage and hospitality event for the gaming industry highlights the continued popularity and importance of the dining experience within gaming. This dedicated event shines a spotlight on the importance of entertainment within casinos as a critical and growing part of the overall guest experience. Exhibitors! Do you need models for your booth?